Children's author Carol Wedeven has been writing since she was a child herself. A former classroom teacher, Carol now teaches at writer's conferences and writers' groups. 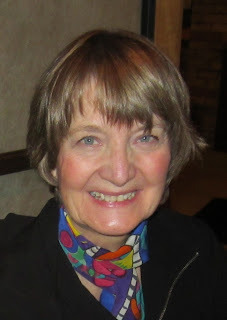 GLVWG member Phyllis Palamaro got in touch with Carol to ask her some questions about herself, her wriitng, and the sessions she'll be teaching at the Write Stuff. Phyllis: Who encouraged you as you were growing up to be a writer? Carol: Aunt Wilma had always wanted to be a writer. The bar in her small kitchen kept piles of library books, strews of paper, loose pencils and erasers, and a rickety, clickity black typewriter. I watched her type with intensity, eyes focused, thinking, creating, as black words appeared on the paper she had recently rolled into place. Line by line, a pageant script grew. When the writing was finished, I acted the part of a nurse in one of the panoramic historical scenes on the stage of our city’s new Civic Center. It was then that I realized what a difference words on a page could make. They could move and change the hearts of people. Aunt Wilma had no idea she was encouraging me. In merely doing her thing, she showed me the writing process and showed me that if she could do it, I could too. My mother, Aunt Wilma’s sister, encouraged me to look for new ways to create something different, to recreate trash into something useful, interesting or even beautiful. My mother made flour ‘n’ water paste for binding my first self-published (smile) book: eight 3” x 5” pieces of scrap paper with crayon illustrations and a story about Roy Rogers. Jean Hill, storyland lady at WHTC Radio, fed my imagination. The state of Michigan sponsored Americanism essay contests. The award I received, signed by Governor George Romney, encouraged me to aim at excellence. Teachers encouraged me to edit the school newspaper and to write monthly science stories for a children’s educational paper. Someone asked me to write an article for a teen magazine. I did that too. Seeing my byline and stories in print, and knowing children would read them, hooked me on writing even before I got the pleasant surprise of a check in the mail. Phyllis: When did you begin to think of yourself as a writer? Carol: Even during my early years, I put words on paper, any paper--on pieces of mail, filling in blank insurance forms tossed into the trash, Sears & Roebuck order blanks, grocery lists my mom might (not) pass on to the grocer. I taught children to write and read stories they wrote. When a writer friend told someone I was a writer, I corrected her. “I’m a teacher,” I said. My friend persisted. “Okay,” I finally said, “I’m a writer.” I eventually realized that being a writer isn’t necessarily precluded by my not being published big time. I was a writer before I ever penciled a squiggle or wrote a word. It had taken me years to realize that my writing journey began the day I was born. Phyllis: I attended your session this summer at the Philadelphia conference, “Seeing Through the Eyes of a Child.” Where did that idea come from? What do you expect your attendees to take away from the session? Carol: I have always cared about children and was often able to read their heart. One of the rules for writers is to know your reader. Inside and out. Anyone with 20-20 vision with or without glasses can see a child and write a description. But what kind of glasses does it take to see the inside of the child? Observation, experiences, childhood memories, understanding, seeing through a child’s point of view, knowing a child’s fears, dreams, hopes, foibles, vocabulary, way of thinking, developmental details, abilities, and more. The list is long, but the short of it all is this: When a reading child senses our heart in words on the page, we gain trust, and that’s when our words have an opportunity to make a difference in the heart of the reader. In class, we will become the child and gain first-hand insight into the heart of the child. Phyllis: What is your advice for new writers? Carol: Think, imagine, dream. Court Aha! moments. Learn something fresh and new everyday. Write or create artistically in other ways each day—even if it’s for five minutes. There is no perfect manuscript. Welcome and enjoy the work of making improvements. Write, rewrite, repeat, until a manuscript boasts your personal best. Aim for excellence. Be strong and courageous. Discipline and practice make great writers greater. Read, read, read. Write, write, write. Today’s good, bad or ugly is bound to improve. Carol: I write to show God’s truth. I hope the redeeming God factors in my books show that the spirit life of every flawed character can be changed from darkness to light, that is, from the spirits of greed, selfishness, and other dark characteristics, to the spirits of love, joy, peace, patience, gentleness, goodness, kindness, faithfulness, and self-control. This is God’s truth, which children and adults seek. Hopefully, seeing transformation happen in the life of a character will ignite an “Aha!” awareness of light for the reader. Phyllis: What new books are you working on? Carol: My current writing project, A Rose from the Ditch, is a work of narrative nonfiction for women based on the true story of Sooni, an Amerasian girl in 1950s Korea. After years of struggling in the ditch of hunger, poverty, prejudice, and persecution, and after Sooni is orphaned, she is redeemed by author Pearl S. Buck, who invites Sooni to come to America to live with her as her daughter. This story is one of rags to riches, Buddhism to Christ, and rice to ice cream. I also have several children’s books stewing on the back burner, improving with age as they wait. Phyllis: What different genres would you like to try? Carol: I will always write for children, but I also hope to write books for tweens and novels for women. Phyllis: Why is writing important to you? Carol: I can’t not write. I write 24-7. Even when my pen is put to rest, my heart and mind are filled with words, concepts, ideas, directions, concerns, wonderments needing to be shared. Writing is important to me because, as I scribble words on a page, they show me who I am, making heart words visible, available for me and readers to see, to wonder about, to receive and to maybe be open to change. Readers give my writing purpose, but writing gives me purpose.